I was so excited to have learned so much making my first sweater, the Feather & Fan Lace Sweater, that I wanted to apply all that newly acquired knowledge to another project right away! And I did. 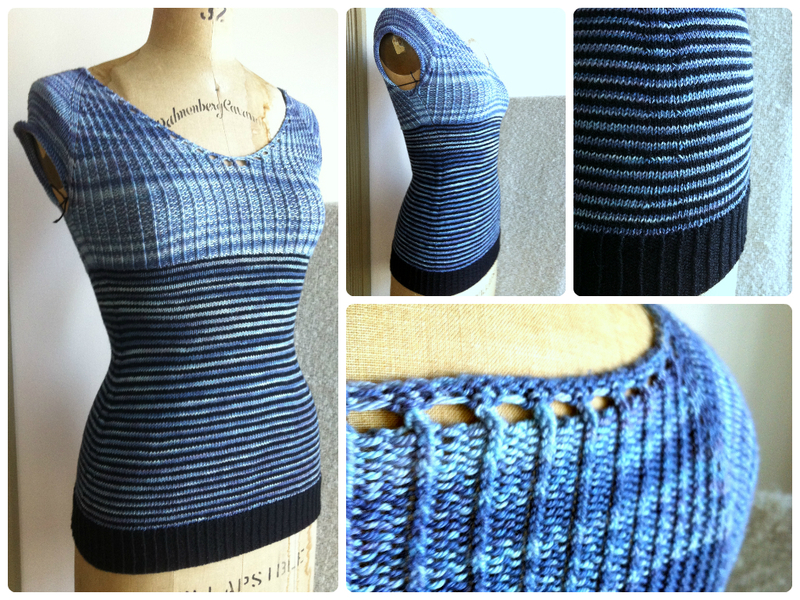 I present you today my second sweater, the Summer Sea Stripes! It’s not completely finished yet (I still have to make the sleeves) but I’m pretty happy about how it turned out so far!!! There are still a few mistakes here and there (which project is perfect, really?) but I’m much happier about the fit of this one compared to the first one I made. My first sweater was made to measurements, but realized after wearing it a few times that I did not like the fit so much as it felt kind of baggy and stretchy. To fix that problem, I decided to make my second sweater with 2 inches of negative allowance to give it a snugger fit. And it worked perfectly! It is just SOOOO comfortable and so nice! I couldn’t be happier about how it turned out! And the colors! Oh My God, The Colors! I designed this pattern to maximize the yardage I had in both colors, but I must say it turned out way nicer than I expected! Both are 75/25 Superwash Merino & Silk sock yarns, very soft and very smooth, with a lovely drape and an exquisite sheen. The black yarn is Cascade Heritage Silk that can be purchased both on Little Knits or on Webs (you can check out the Craft Ressources page of my blog for links to both these online yarn stores. You’re welcome! ), I used 1 skein of it for my sweater. The blue yarn has got to be my best discovery of the month. It’s the Squishy Sock yarn, an exclusive product made by Chroma Fiber for the Artfil Yarn Shop & Craft Café, a little yarn boutique my friend Yana recently opened in Laval, Quebec. It is 356 yards of scrumptious deliciousness, hand painted by a local artisan in Montreal. It is simply gorgeous. If you’re interested, you can find it in store at the Artfil Yarn Shop & Craft Café, or you can buy it online on their website at http://www.artfil.ca/products/chroma-squishy-sock. I recently made a review for this yarn, if you’re interested in reading it you can find it here. This entry was posted in Crafts, Knitting and tagged craft, knit, passion, sea, silk, stripes, sweater, yarn.